Top/Shirt : Display your bold stripe in this Beige Katan silk shirt worked with amazing decorations throughout shirt. Shirt with half sleeves and embellished U neckline style. Fully lined. Hidden back zipper closure. Red banarsi edges finished. 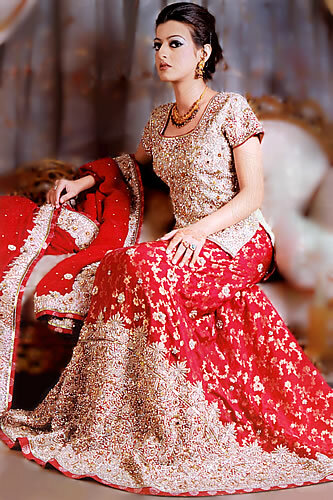 Bottom/Lehenga : Lust banarsi jamawar lehenga with mermaid silhouette add charm to the wearer. Designed with beautiful decorations and embroidery work on the border and the front together with small-sized rounded ornamental motifs spread all over. Little train has made this lehenga for a romantic fantasy. Fully lined. Hidden side zipper. Dupatta / Veil: crinkle chiffon dupatta Lust bordered with rich detailed decorations. Floral Motifs-shaped decorative motifs are embroidered with sequins spray comprehensive. Banarsi edges finished. Embellishment work includes sequins, beads, dabka and Swarovski crystals. 100% handmade embellishments. 100% pure highest quality imported fabrics. Made in Pakistan. Thank you for your order which I received yesterday, both outfit looks as good as it did on internet. Once again I thank you for the prompt delivery and I'm happy with the both product. Click the button below to add the BW6845 Beige Lust Red Lehenga to your wish list.